And now, from the shallow end of the gene pool…cops in happy Valley, OR were called to a suspicious person looking into cars. The constabulary arrives and the guy is found laying flat in the front seat of his car. When an officer shines his light on the guy he sits up straight and takes off. A pursuit takes place and his tires are spiked. 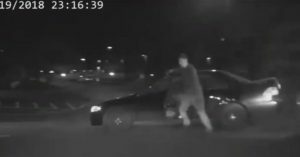 Our not so fleet of foot felon gets out of the car while it is still rolling and attempts to run. He cuts in front of the car just before it crashes into a building. Suspect running alongside of car after tires spiked. After the cops jacked up the car and removed him from his precarious situation he was taken to the hospital where he was treated for numerous fractures of his right leg. When he’s released from the hospital the cops will be waiting with a bunch of warrants for theft, tampering, numerous traffic violations and fleeing to elude. He shouldn’t be to hard to catch with the broken leg and all. Maybe this guy just isn’t cut out for a life of crime. STAY SAFE, BUCKLE UP, WEAR YOUR SEAT BELT AND TURN ON YOUR CAMERA! Blue Lives Matter Christmas Trees give kids a Christmas.